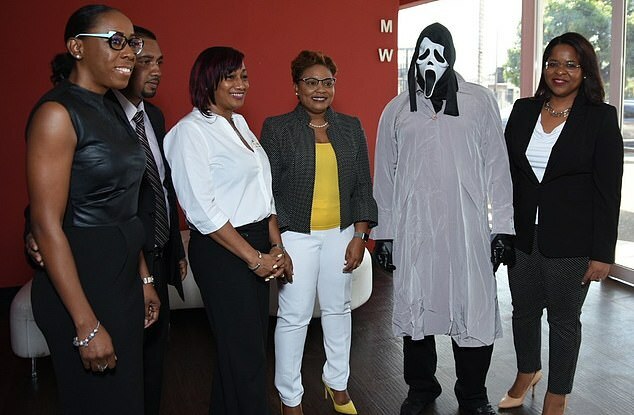 A Jamaican man turned up to claim his £1million prize wearing a mask from the movie Scream. According to Distractify, the man, who identified himself as A. Campbell, decided to collect the prize incognito so he wouldn’t have to share the money with cash-hungry relatives. Mr Campbell waited 54 days to collect his $158.4 million ($1.17 million US) prize from the nation’s Super Lotto, after his original win in November last year. Normally, I would write down the numbers from the [televised] draw, eat and then go and check my numbers,’ he said. ‘I want to get a nice house. I haven’t found it yet, but I’ll be looking for one soon. I like to handle money. I don’t beg, I don’t borrow,’ he said. Back in June, another Super Lotto winner decided to wear an emoji mask to protect her identity after she won $180,900,000 in Jamaican money.